Shade Details: 3.5" x 24" x 7"
The Miramar Table Lamp conveys a truly architectural presence, with its truncated geometry and monolithic, fluted base. This table lamp features ribbed ceramic in Porous White or Crystal Bronze glazing with an Antique Brass shade. This collection features alabaster stone coupled with luxe metals. The organic carved alabaster pieces, set in a prong setting of rich natural bronze, posses a poetic, paired-down luxury of easy refinement. Available in Antique-Burnished Brass, and Bronze with Alabaster. With its repetitious decorative spheres on a beautifully sculpted ceramic base, the Linden Table Lamp is a playful contrast of both fun and sophistication. This Table Lamp features a Linen shade, Antique Burnished Brass detailing and comes in either a Black Porcelain or White Plaster ceramic finish. 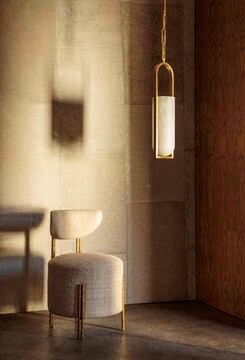 The Alta collection is composed of sculptural pieces that are a pure statement of elegance and subtle for any interior. Geometric silhouettes reimagined in a sculpted, natural materials become gracefully statuesque. Available in Sand and Black Stripe, and Porous White and Ivory with Linen Shade.